VANCOUVER, BC – Enjoy interviews with world renowned piano maker Paolo Fazioli, award winning architect Michelle Biggar, international concert pianist Angela Hewitt, and the general manager of all new Fairmont Pacific Rim hotel Randy Zupanski. The new white Fazioli is now in its permanent location as a centerpiece in the lobby of Vancouver’s new Fairmont Pacific Rim Hotel. The piano was commissioned by the hotel’s owner for design by award winning BC architects McFarlane + Green + Biggar. 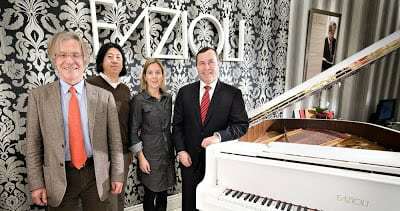 The $225,000 Fazioli piano in satin white features a stunning 3D design underneath the lid, has many parts plated in 18K gold, and will be a permanent centerpiece of the hotel lobby. 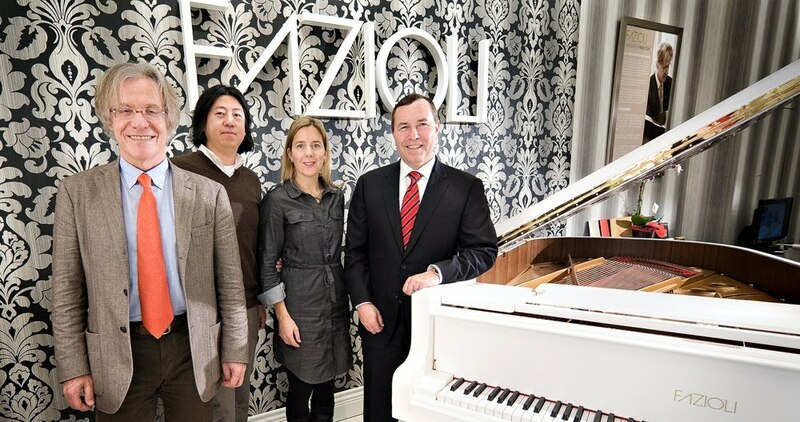 Founder Paolo Fazioli travelled from Italy to personally unveil the one-of-a-kind white piano at a media event for the piano at the new Showcase Pianos Fazioli store in Richmond’s Aberdeen Centre. The video also features performances by Tim Zhang, Scott Xiao, Spencer Zezulka, and duo Michael & Jamie Onwood.